Elements Applied: Each part of the plant except the root is applied in herbal medicine. Other: fats, gums, resins etc. Used For: The remedy is applied for treating asthma, relieving spasms, treating coughs, and assisting the nervous system. It is additionally known to cause vomiting, boost urination and perspiration. 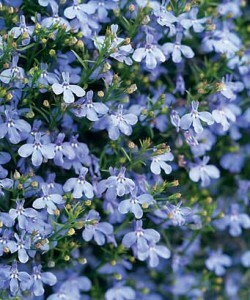 Lobelia has gained its popularity due to its capcity to relax the organism. It is used as a sedative for autonomic and central nervous systems, and for muscle tension. The herb may be used in a mixture with other potent plants, which are known to produce a sedative effect on the organism. Additionally it’s applied as a remedy for bronchitis and asthma. Lobeline, its constituent, is widely applied as a treatment for respiratory diseases, and produces an expectorative effect, providing muscle relaxation in the area. Its general effect consists in a conjunction of two effects: relaxing and stimulative. Commonly mixed with: Especially potent if mixed with Ephedra, Sundew, Spurge, Grindelia, and Cayenne in asthma therapy. Additional Info: Commonly found in the eastern parts of the US. Preparation and Intake: If prepared in form of infusion the herb is taken in a dose of ¼ to ½ teaspoon and mixed with boiling water, which is kept infusing for 15 minutes. Consumed thrice a day. In form of a tincture the herb is applied in a dose of 1-2 ml thrice a day. Safety: Lobelia is somewhat toxic and should only be used under medical supervision. Topical application is absolutely safe. There is no more data concerning the plant’s safety level. Still, there is a possibility of interaction with chemical medicines. It’s highly recommended to have a consultation with a health-care provider before using the medicine.